The Archaeological Areas of Pompei, Herculaneum and Torre Annunziata provide a complete and vivid picture of society and daily life at a specific moment in the past. On August 24 of the year 79 AD, the Vesuvius volcano in southern Italy suddenly erupted. It buried the surrounding towns under layers of ash and rock. 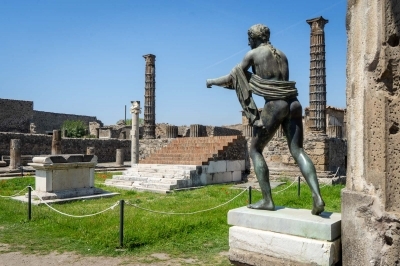 Pompei, an urbanized and commercial town of 25.000, was hit fully. The Roman colony was just recovering from a bad earthquake in 62 AD. The site was rediscovered in the 16th century, but exploration did not begin until 1748. Besides Pompei, this WHS consists also of Herculaneum and the Villa Oplontis at Torre Annunziata. It provides a complete and vivid picture of society and daily life at a specific moment in the past that is without parallel anywhere in the world. The site at Pompei is extensive, and takes at least half a day to explore. The granary shows plaster casts of victims of the eruption, their expressions especially impressive after hearing the stories on the news about the south Asian tsunami disaster. Just like those victims these ancient Pompeians had no chance. I've seen quite a lot of ancient excavations, but due to the special circumstances under which it was preserved this one is really special. The feeling of the town as a whole has survived: not only the major buildings, but also the streets, the normal houses and the restaurants. Take for example the ubiquitous Thermopolia, where snacks could be bought. You can just imagine having a quick lunch there yourself. The rich preferred to build their villas just outside the town, overlooking the sea. One of these is the Villa of Mysteries. Here I sheltered from a hailstorm. 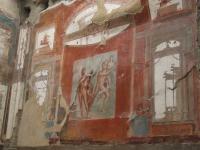 The villa is decorated with several extremely beautiful and well preserved / restored frescoes. The dining room in the front has a large painting of a woman's initiation to marriage. Elsewhere there are delicate Egyptian motifs waiting to be admired. I visited this WHS in November 2018 focusing on 2 locations out of the main 3 inscribed, namely Pompeii and Villa di Poppea di Oplonti. I'll definitely visit Ercolano in the near future as the I have no doubt that it is on par with the 2 locations I visited which were top WHS. I allowed a full day for Pompeii and parked next to the entrance/exit at Camping Zeus. Even though Pompeii is always visited by tour groups with their infamous antenna rod and all kinds of soft toys, the site is so big and vast that it didn't feel too crowded, especially first thing in the morning when most would be gobbling their included breakfasts. Make sure to pick up a free map from the information office before entering as it's quite confusing otherwise to find your bearings at first. Pompeii is truly an intact (although crumbling) ghost town from Roman times with an extraordinary setting at the foot of the culprit volcano of its destruction as a living town and a great opportunity to understand the 'ordinary' day-to-day life during Roman times. 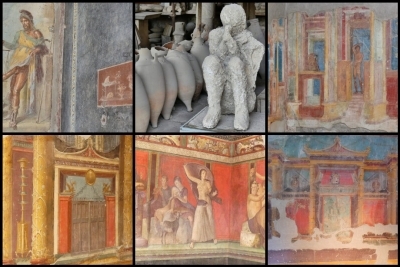 At Pompeii, you get to experience the whole ensemble of Roman architecture: temples, villas, houses, shrines, stores, necropolis, mosaics, frescoes, stucco, thermal baths, water management, outposts, roads, amphitheatres, etc. Out of all this outstanding site, the absolute highlight of my visit were definitely the intricate and colourful murals and frescoes. The best ones in my opinion were those at the Villa dei Misteri (the farthest from the entrance and the first recommended place I'd suggest to visit before the crowds), the Casa dei Vettii (quite close to the cafeteria and toilets), the Casa del Menandro, the Casa del Frutteto and the Palestra dei "Iuvenes". The peculiar Priapo mural with an oversized phallus at the entrance of the Casa dei Vettii symbolises the economic prosperity of the domus' owners. If you're after the unmistakable Pompeii colours of the frescoes, make sure not to miss the second inscribed location of Villa di Poppea di Oplonti in Torre Annunziata which is practically similar in size to the Villa dei Misteri. The first Sunday of each month, entrance to all historic monuments is free! The National Archaeological Museum in Naples has several other frescoes from Pompeii and Herculaneum apart from various artefacts. Another impressive aspect are the Pompeii casts. Liquid plaster was poured in the empty moulds left in the ashes of the pyroclastic flow of the volcano. Impressive expressions of the victims of Pompeii were caught by this technique in the tragic instant of their death. Very recently a tiny graffito from before the Pompeii disaster was discovered showing that the eruption must have taken place in autumn rather than in summer. 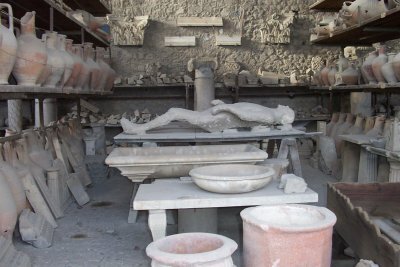 It can be seen at Regio V at the Casa con giardino in Pompeii. All in all this is yet another top WHS in Italy. PS: next to the entrance to Villa Oplontis, there is a UNESCO inscription marker. I don't think anything can quite prepare you for visiting Pompeii. The site is so large that it's overwhelming at first and it's hard to know where to go and what to see. After a couple of hours of exploring, it all starts to make a bit more sense and you get a sense of how the the urban design is laid out. I guess it's like every time you arrive in a new city - it takes a little while to get your bearings. Pompeii is the kind of place where a guide or an organised tour would actually be really useful. I didn't have one and I regretted it by the end. But, having said that, there was also something really nice about being able to wander and explore such a vast site by myself. If you're thinking of visiting yourself, I've put together a map of Pompeii with highlights based on what I discovered when I spent the day there. I hope it is useful to some people. The excavations of Pompei are huge, so I devoted a half day to walking the streets, starting at the amphitheatre and finishing at the Villa of Mysteries. I stopped off to view frescoes, the pristine mosaics and complete dwellings. 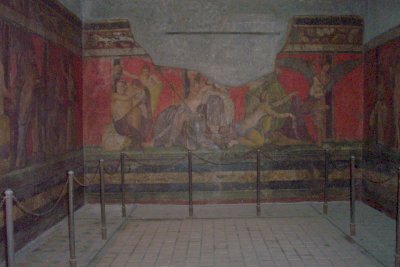 But the highlight was the brightly coloured frescoes of the Villa of Mysteries. From the nearby station I travelled a short distance to Torre Annunziata to visit the Villa of Poppea at Oplontis. A much smaller site but with many colourful frescoed walls. Travelling on from there by train to Ercolano I soon reached the excavations of Herculaneum. I thought the houses lining the Cardos here more interesting than those at Pompei, and the decorations were still spectacular. Although quite spread out, this site is much easier to navigate, as the whole site can be seen from above. Pompeii is such a major tourist attraction that nearby Herculaneum remains in its shadow. 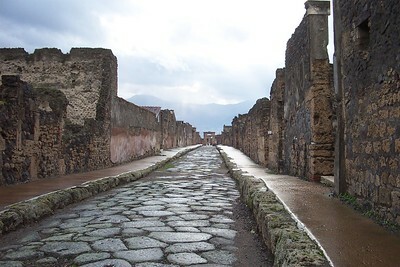 It is true Pompeii is much larger and in some respects better preserved (wooden furniture and mummies for instance were only found there), however, you have to pay for that by going along the often overcrowded lanes and missing so many houses that are now locked up due to the big crowds. Herculaneum was destroyed at the same time and in the same manner as Pompeii. It is smaller but features similar houses with beautiful gardens and frescoes. Actually Herculaneum features some multi-storey houses, absent in Pompeii. 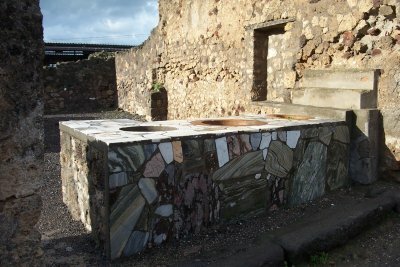 During my visit in 2007 almost all houses in Herculaneum were open. This gives you the impression you can really wander freely around the town and go wherever you like on your way to explore it. This was an exciting experience. There also significantly less visitors around. Try to visit both cities if you can, but if you come during the rush season I would almost recommend to visit Herculaneum instead of Pompeii. It is beautiful. If you go to Herculaneum try to visit the nearby Villa Campolieto, a Neoclassical mansion of the 18th Century belonging to the Golden Mile of the Vesuvian Villas. Pompeii has been described so many times that I don´t need to add that much. But if you have never been there, go there or you will miss the most amazing archaeological site anywhere. History really does come alive here, despite the huge crowds. Unfortunately I could only be there for a couple of hours, but I certainly hope to return there as soon as possible, hopefully also to visit Herculaneum, which supposedly has the more interesting remains (if that´s at all possible), and maybe the Villa Oplontis. If you can, combine a visit to Pompeii with a hike up Mount Vesuvius (auto road, walking route for the last few hundred meters over slippery terrain) so it all comes into perspective. The mountain is very interesting both from a historical and from a geological/volcanological perspective and offers great views of the Bay of Naples (unless it´s foggy or the smoke from the crater covers your vision), one of the most beautiful vistas in Europe. The first thing that impressed Jim about Pompeii was its location. How did the city planners, in several centuries BC, know just where to place Pompeii so that 2,000 years later it would be at an off-ramp of the Autostrada, next to a railway station, hotels, and the campsite. That’s careful planning. It’s interesting to note that Pompeii’s amphitheater, and the two theaters, are perhaps the most complete structures of their type to have survived the ages. Since they were buried below the ash of Vesuvius, they did not suffer the destructive power of wind and rain, and stones could not be quarried and stolen for other building projects, as happened elsewhere. A housing shortage in Italy resulted in most young people living at their parent’s home, rather than in their own apartments. The well-dressed young people in nice cars were waiting an hour or so to rent a room in the Pompeii campground for an hour or so, or maybe after such a long wait, just a few minutes or so. How romantic! Designed by or influenced Le Corbusier: He writes of the ideas he developed from viewing the Casa del Noce "CASA DEL NOCE, at Pompeii. Again the little vestibule which frees your mind from the street. And then you are in the Atrium; four columns in the middle (four cylinders) shoot up towards the shade of the roof giving a feeling of force and a witness of brilliant methods; but at the far end is the brilliance of the garden seen through the peristyle which spreads out this light.... (Le Corbusier, 1927, p. 183)"
Early Archaeology: Excavation of Herculaneum started at 1738. It was the first site ever to have been excavated. Historical Graffiti: Over 11,000 graffiti samples have been uncovered in the excavations of Pompeii, which "often offer rich insight into the lives of the city’s residents". Opera: Torri Anunziata (Poppea's Villa) in The Coronation of Poppea by Monteverdi. 443 Community Members have visited.